Okwi wheels away in celebration after scoring the priceless goal against Egypt. Shaban Lubega. FOOTBALL–An unlikely empty Namboole Stadium did little to dampen the spirit of Uganda Cranes as they made home advantage count with a priceless 1-0 win over record African champions Egypt in a Russia 2018 Fifa World Cup qualifier Thursday. Tanzania-based striker Emmanuel Okwi scored the solitary goal six minutes into the second half after the Pharaohs had failed to clear their lines following a Faruku Miya corner kick. Egypt had a goal ruled out for offside when Muhamed Salah crossed for Hassan Mohmoud who flicked the ball past the steady gloves of Africa’s top-ranked goalkeeper Denis Onyango but the Egyptian celebration was cut short with the waving flag of the assistant referee, who adjudged on-rushing Soliman Mohmoud to have interfered with play from an offside position. That half time escape would prove crucial and Uganda made the most of it later having laboured and in the opening half although they did enough to contain the much heralded Pharaohs. The only clear cut chance Uganda had in the first half came courtesy of Okwi who connected first-time on the volley with a Joseph Ochaya long pass only for legendary Egyptian goalkeeper Essam El-Hadary to parry the ball out of danger. Coming into the top of Group E clash, Egypt had not lost to Uganda since 1965 and were highly fancied to make the most of their professionals such as English based duo of Mohammed Salah of Lvierpool and El Neny of Arsenal count. But fame is one thing, Namboole is another. The Egyptian learnt this the hard way and if they had taken Uganda for granted prior, given even their late arrival for the match, they will be slapping themselves in the face and doing thorough post-mortem. The huff and puff and scoreless half time appeared to have awakened Egyptian Coach Hector Cuper out of his reverie as he realised Cranes were never to be taken for granted even after the departure of Milutin Sredojevic Micho just a month ago. Cuper, who made his name with Spanish side Valencia 16 years ago, made an immediate change at the start of the second half, throwing in Ahmed Ramadan Sohbi for the ineffective Hassan Mohmoud, but before his tactical change could sniff at the bumpy Namboole pitch, Uganda had taken the lead on 52 minutes. Egypt made a further two substitutions in the second half with Saliman Mohmoud and Terek Ahmed both coming off and replaced by Ahmed Amir and Salah Salah, respectively but could not inspire the Pharaohs to getting the elusive goal as Uganda stood firm in defence. “It was a difficult game on a poor pitch but we can go home and work on our mistakes so that we win the return leg on Tuesday.” said Egyptian coach Hector Cuper after the game. Uganda’s interim coach Moses Basena was full of praise for his players after the win. “All i can say is that am proud of the boys because we came into this game with several of them not having enough playing time but they got the result against a formidable opponent,” said Basena, who took over in interim role together with Fred Kajoba in the wake of Micho’s decision to wake out on Cranes. Basena and Kajoba were assistants to the Serbian. “We highly believe we can qualify for the world cup and today’s result will inspire us to go to Port Alexandria and fight for at least a point,” added Basena, who only last week appointed Express tactician Matia Lule and former Cranes inspirational skipper and defender Ibrahim Sekagya to his backroom staff. 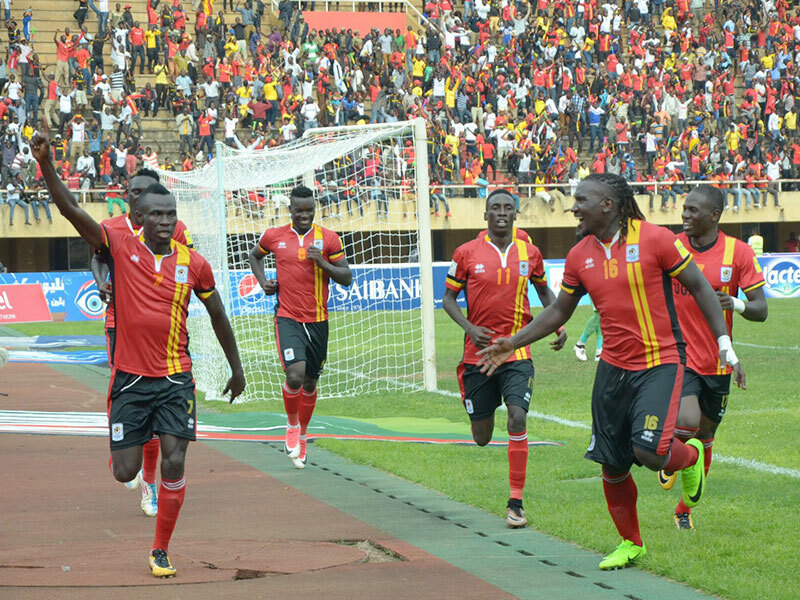 Uganda will now travel to Egypt for the return fixture on Tuesday before completing the campaign with games at Congo Brazzavile and Ghana (at home) in October. Egypt are now second on the log in Group E with six points, one behind leader Uganda. Congo Brazzaville, who are yet to pick a point, play Ghana away on Friday before they lock horns next week in Brazzaville. Ghana only has one point earned at home against Cranes. Kizito Luwaga for Farooq Miya. Geofry Sserunkuma for Emmanuel Okwi. Isaac Muleme for Joseph Ochaya .